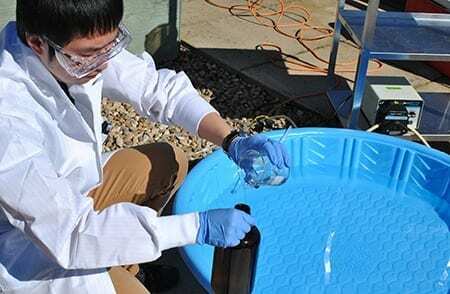 Civil engineering graduate student Zengquan Shu simulates the solar UV/chlorine treatment process. Laboratory-scale tests found the solar UV/chlorine treatment process removed 75 to 84 per cent of the toxins found in tailings ponds. Cleaning up oil sands tailings has just gotten a lot greener thanks to a novel technique developed by University of Alberta civil engineering professors that uses solar energy to accelerate tailings pond reclamation efforts by industry. Instead of using UV lamps as a light source to treat oil sands process affected water (OSPW) retained in tailings ponds, professors Mohamed Gamal El-Din and James Bolton have found that using the sunlight as a renewable energy source treats the OSPW just as efficiently but at a much lower cost. “We know it works, so now the challenge is to transfer it into the field,” says Gamal El-Din, who also worked on the project with graduate students Zengquan Shu, Chao Li, post doctorate fellow Arvinder Singh and biological sciences professor Miodrag Belosevic. Oilsands tailings ponds contain a mixture of suspended solids, salts, and other dissolvable compounds like benzene, acids, and hydrocarbons. Typically, these tailings ponds take 20 plus years before they can be reclaimed. The solar UV/chlorine treatment process when applied to the tailings ponds water would make OSPW decontamination and detoxification immediate. The sun’s energy will partially remove these organic contaminants due to the direct sunlight. But, when the sunlight reacts with the chlorine (or bleach) added to the OSPW, it produces hydroxyl radicals (powerful oxidative reagents) that remove the remaining toxic organics more efficiently. The chlorine leaves no residuals as the sunlight causes it to decompose. In laboratory-scale tests the solar UV/chlorine treatment process was found to remove 75 to 84 per cent of these toxic organics. April 11, 2019 - This is the world's most destructive oil operation—and it's growing National GeographicIndigenous people and environmentalists want to prevent the expansion of Canada's oil sands development, and the water and air pollution that come with it. April 17, 2019 - Oilsands polluted more than entire economies of B.C. or Quebec National ObserverCanada's oilsands sector, the country's fastest growing source of greenhouse gases, now produces more pollution than the entire economies of B.C. or Quebec. March 27, 2019 - Oil Sands M&A Grinds To A Halt | OilPrice.com OilPrice.comMerger and Acquisition activity is slowing down in the Canadian oil sands industry as producers continue to struggle with pipeline constraints.